Pupils in mainstream primary schools are gaining the benefits of Story Massage sessions in class. Here are six videos to show how teachers and learning mentors, who are qualified in sharing the techniques, have introduced Story Massage sessions within the primary school day. This video shows how Year 5 Pupils at Kingsmead Primary School are learning to share positive touch in a kind and respectful way. They are demonstrating a story written by Class teacher, Olivia Silver, especially for them to help understand the value of positive relationships. “The effects of Story Massage have been astonishing; the children have been much more focused in class; they start the day relaxed, feeling positive and ready to learn. They have become more respectful of each other’s personal space. 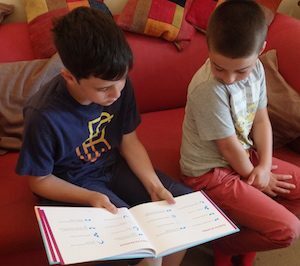 Some of the children have been doing Story Massage with their parents and siblings at home, which is a lovely bonding experience for them too.” Olivia Silver, Class Teacher, Kingsmead Primary School, North London. This video shows a class session at Thorntree Primary School in Glasgow with P7 pupils. The session uses ‘What Do You do with the Mad that you Feel?‘ by Fred M. Rogers as a focus for sharing positive touch followed by a discussion about the message in the words. “Pupils find Story Massage helps with relaxation, well-being and regulating emotions. They have started to ask for Story Massage as they know it will help them calm down. We have worked with pupils to write massage stories to deal with problems such as family bereavement, divorce in the family or the loss of a pet. It helps children to express their feelings in a safe and nurturing way and put those difficult emotions into words.” Justine Horn, Deputy Head, Thorntree Primary School, Glasgow. Story Massage is part of the well-being curriculum at Bowker Vale Primary School in Manchester. In this short video, pupils demonstrate how Story Massage has helped to promote kindness and positive friendships within the school. “We encourage the children to write their own massage stories. There is much fun and debate around choosing which Story Massage stroke should accompany the words. The children learn to listen to each other and take turns in making decisions. They are learning important lessons in forming positive relationships. Story Massage is also used widely in literacy lessons and teachers have noticed an improvement in creative writing and vocabulary. The children say that Story Massage brings the stories alive. It also helps them to retain information such as dates, numbers and names.” Jo Heald, Well-Being Co-ordinator, Bowker Vale Primary School, Manchester. This video shows children sharing Story Massage in a nurture room at Quarry Brae Primary School in Glasgow. They worked together to write a massage story especially for the birthday girl. “The benefits of positive touch activities through Story Massage have been amazing. It is one of the best training days I have ever attended. Story Massage is an invaluable tool, quite literally at your fingertips, that can bring so many benefits for children. 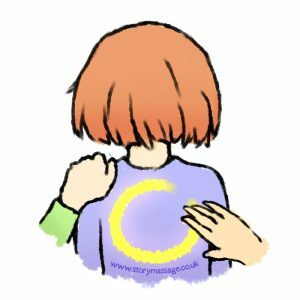 Story Massage gives children an opportunity to show they care for each other and to work on their co-operation skills which for many children in the nurture room can be very difficult. We have found that Story Massage helps children to express their feelings in a safe and enjoyable way which helps foster a positive trusting bond. Pupils know they are cared for, can be listened to and they learn how to access a mindfulness approach through Story Massage.” Charlene Craig, Nurture Teacher, Quarry Brae Primary School, Glasgow. This video shows a massage story written by pupils at St James Primary School in Dublin 8 to help them express and explore the difficult feelings such as those at the end of the school year. Story Massage has become part of regular activities at St James Primary School following an in-house training day. The children respond very well to Story Massage. It helps them to feel safe and secure within themselves. They find it very relaxing and calming. We use it every day to help them settle for more quiet and concentrated work. It also teaches the children about kind hands – they ask each other if they want a massage when they are playing in the yard.” Heidi Mahon, Class Teacher, St James Primary School, Dublin 8. Story Massage combines the benefits of positive, respectful touch with the creativity and engagement of storytelling. Ten simple massage strokes form the basis of the Story Massage programme. These strokes have a child friendly name, such as The Circle or The Sprinkle, and an easy to recognise symbol making it accessible for all. It is a fully inclusive activity, no clothing is removed and no oil is used. Stories can be taken from our Story Massage book, adapted from favourite stories or songs or you can create your own massage stories. Are you inspired by the way that Story Massage is being used for primary school pupils? Would you like to train to use Story Massage in your work or home? We run a one day accredited training course held around the country for individuals and groups. These days can also be organised as in-house training sessions. And we also have a new online training option.